A cat sleeps on a cushion in the corner of a room while a fourteen year-old virgin receives her pregnancy results from a beautiful, transgender visitor, who presents Madonna lilies as a baby shower gift. She smiles sweetly, and lowers her eyes modestly, grateful but not surprised. She accepts the news in the composed manner of a young prima donna receiving the bouquet that her talent deserves. The visitor has only just arrived, interrupting the girl reading a small, pocket-sized book, which she lays aside instantly, without closing the pages or rising to her feet. The girl reads a lot. She has few possessions apart from her expensively bound books. She reveres their contents, kneeling while she reads. Her room is sparsely furnished, functional; only the voluptuous folds of the dark red drape loosely knotted over the window relieve the cell-like austerity. She cares about the cat’s comfort as much as her own. She has hung her hat and shawl neatly on a hook. The polished stone tiled floor is clean. Nothing else is normal, and yet the scene is familiar. The visitor, who kneels before the girl as if she is a queen, has wings, and is accompanied by two over-excited flying babies, clapping their hands and gurgling with joy on either side of a hovering dove. The window drape looks like a stage curtain, framing a view of a white turreted castle on a hill, guarding a city beyond, a landscape in fairyland. Strangest of all, the ceiling has been removed from the room. The billowing curtain blends into clouds that separate to allow a gigantic elderly man with a long beard to peer down out of a hole in the sky. Golden light radiates behind him, crowded with faces of more chubby babies, made of the Sun, all pressing closer and closer to the girl in the room. He holds his hands palms down over the girl like a puppeteer pulling invisible strings. The most personal of Gijsbrechts’ deceptions casually pins down all art, and individual identity, as a coat of arms on a plain wooden board. A musical instrument, the tools of his own craft of painting, even himself, in a miniature self-portrait, are stuck there, a declaration of THIS IS ME, all in vain, until somebody three and a half centuries later looks at them. We should be so lucky, to create anything so well-made that it lasts beyond a moment on the web. Most of it is worthless, read or not. Words, words, words as a fictional Danish prince said in around 1602. There is nothing deep here, on this blog, only a brazen attempt to create the illusion. I don’t know much about Nihilism and Existentialism, and can seldom untangle a metaphysical conceit, but, as I like the sound of the words, I’m content to use them as labels for states of mind, alluding to concepts without fully understanding them, just like a monkey would, and now with WP technology I can tag them, separating them with commas, meaninglessly. “Words are wise men’s counters….but they are the money of fools” (Hobbes, Leviathan, 1651). I blog profitlessly, in every sense. I shouldn’t be here at all; I should be out, trying to earn a living, not flirting with dead men and downloading old pictures. “Vanity of vanities! all is vanity” (Ecclesiastes 1:2, King James Bible version, 1611). Cornelius Norbertus Gijsbrechts began his adventure in still-life and trompe l’oeil in Antwerp, then found customers in the German cities of Regensburg and Hamburg, before he was appointed court painter in Copenhagen where he decorated the King’s Kunstkammer, one of the greatest of all European cabinets of curiosities, with his illusions of illusions; no job or position ever lasted, he always moved on, itinerant artist in search of the same theme, first to Stockholm, and then back to Germany, to Breslau, now the Polish city of Wroclaw, and then, almost full circle, he returned to Flanders, ending up in Bruges. On the way, he broke the fourth wall. Gijsbrechts painted a series of representations of cabinets of curiosities, with closed or half open doors revealing the eclectic objects inside, for the Perspective Chamber of the real cabinet of curiosities of the Danish kings, a sort of site-specific art installation, except none of the objects were real. Visitors to the Chamber were unwittingly entering a stage-set. In one of the paintings, they were given a glimpse back-stage. The door opens on to nothing, Lord Rochester’s “Great Negative”, the beginning and end of everything, into which all our words and illusions must “undistinguished fall”, where the cosmos itself started and will end. That is the rational end, but for most of us it is not the end of illusion. We are unable or unwilling to grasp finality in our minds. When we look at the picture, we are tempted to jump into the grey empty space on another adventure of the imagination, through a portal to another world. Gijsbrechts’ tricks with our eyes were intended to entertain, no more, but few things, let alone people, turn out exactly as intended. Some of us spending too much time looking at his painted half open-doors, might find, like Keats looking at the Grecian Urn, an art form “dost tease us out of thought”. Is it something, or nothing? Gijsbrechts was deliberately more frugal in his imagery than most Vanitas painters, so though he produced the staple props of floral, fruity sumptuousness, lobsters and lemons, dead ducks and game, melodramatic skulls and overwrought tankards, in deceptively three-dimensional form, he preferred to concentrate on his bits of paper stuffed into strapped letter boards. A diversion for the spectator merges into metaphysical reflection. Gijsbrechts, Board Partition with Letter Rack and Music Book, 1668. Image: SMK – Statens Museum for Kunst, Copenhagen. The seal of the artist’s patron, King Frederik III of Denmark, dangles above the music book on the left. It became a popular theme for other trompe l’oeil artists in northern Europe, most notably the Dutch born and trained Edward Collier who had a successful career in London from 1693 – 1706. Sometimes topical political messages were included amongst the letters, pamphlets and royal proclamations. Collier commemorated the accession of Queen Anne in 1702, not with a portrait of the woman, but with a collage of documents associated with the event and the Stuart line of succession, symbolized by the seal of her grandfather, Charles I, instantly recognizable in profile by his beard, who had been executed over 50 years earlier. Anne was the last of her family to reign. Dynasties are as transient as everything else. 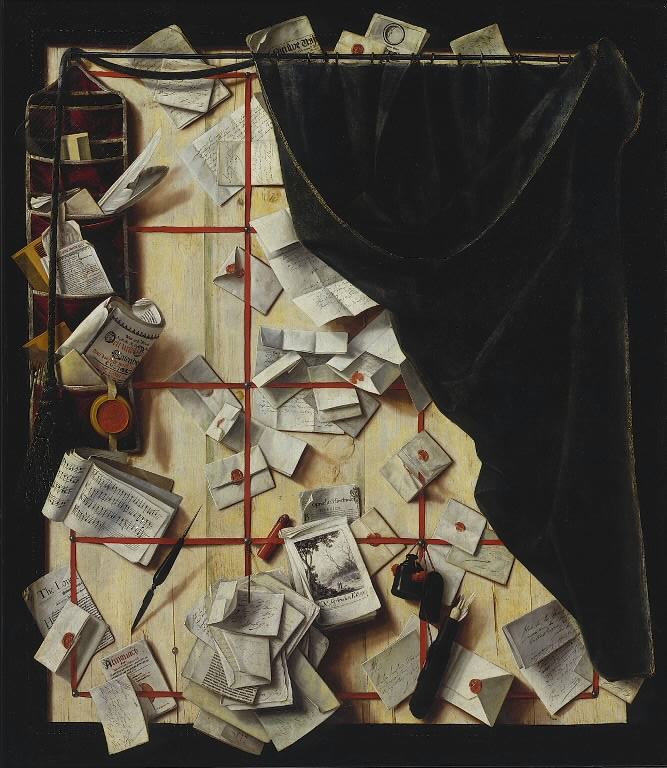 Edward Collier, Trompe l’oeil with writing materials, ca. 1702, oil on canvas. Victoria and Albert Museum. Like some photo-journalism today, particularly at Election time, Collier’s patriotic letter rack is more interesting for its omissions than inclusions. The legitimacy of Anne’s right to succeed is implied by her descent from her grandfather, not her father, also a crowned king with absolutist ambitions, who had been kicked off the throne and out of the country in a coup d’etat fourteen years earlier which saved England, but not Scotland and Ireland, from renewed civil war. To please his patrons of the new political Establishment, Collier erased James II and his son from history. Vanitas painting, like much of 17th century literature and philosophy, is veined with the dread of civil war, the condition Hobbes decried as having “no place for industry”, no agriculture, no trade imports, no communication with the rest of the world “no arts, no letters, no society, and which is worst of all, continual fear and danger of violent death…” (Leviathan). This is why Vanitas celebrates the prosaic commodities of peace; people with memories or imagination knew their value. Neither the objects nor their owners last, but the impulse to have them is carried on through generations. Nothing is what it seems – or Nothing is not what it seems. The trompe l’oeil artist was meeting a demand to both reassure and beguile his patrons, to trick their eyes without disturbing their minds. He could have chosen glamorous symbols of wealth. He chose everyday, random clutter, and transformed the ordinary into a permanent monument to ephemera. Martin Hübscher, Paperwork, photograph by Martin Hübscher Photography © September 2014. A random street scene observed, not posed, by a contemporary German-born photographer from Hamburg living in England. Gijsbrechts experimented with modern graphic minimalism. He explored the liminal space between reality and illusion which preoccupies many artists today. He went behind the picture, beyond conventional religious morality to the other dominant philosophy of the late Baroque, nihilism, and beyond 17th century Vanitas to 20th century Existentialism, to the back of a framed canvas, a picture in search of a painter.